Ethics Professor Poses a Big Question for the Thanksgiving Dinner Table – FIREPAW, Inc. Here is an alternative way of perceiving the world, and your place in it, for Thanksgiving…an op-ed piece printed in the LA Times about the ethics of consuming factory-farmed turkeys for Thanksgiving by bioethics professor and prolific animal rights advocate Peter Singer. Consider the turkey on Thanksgiving. Specifically, consider not eating it. Excerpt: When I teach practical ethics, I encourage my students to take the arguments we discuss outside the classroom. For Americans, there is no better occasion for a conversation about the ethics of what we eat than Thanksgiving, the holiday at which, more than any other, we come together around a meal. The traditional centerpiece of the Thanksgiving meal is a turkey, so that is the obvious place to start. According to the National Turkey Federation, about 46 million turkeys are killed for Thanksgiving each year. The vast majority of them — at least 99% — are raised on factory farms. Newly hatched turkeys are raised in incubators and then debeaked before having their talons cut off. Male turkeys also have their snood removed — the fleshy erectile protuberance that grows from the forehead. All this is done without anesthetic, despite the pain it clearly causes. 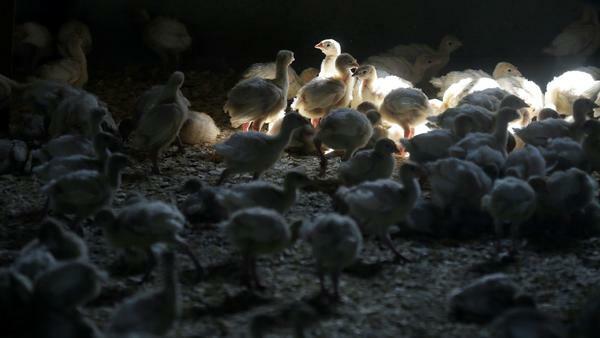 The reason for these mutilations is that the birds are about to be placed in dim, poorly ventilated sheds, where they will live out the rest of their lives crowded together with thousands of other birds. The air reeks of ammonia from the birds’ droppings. In these unnatural and stressful conditions, turkeys will peck or claw at other birds, and cannibalism can occur. The snood is removed because it is often a target for pecking from other birds. When the birds reach market weight, they are deprived of food and water, rounded up, often in a very rough manner, and transported to slaughter. Each year, hundreds of thousands don’t even make it that far — they die from the stress of the journey. If they do make it, they are still not guaranteed a humane death, because the U.S. Department of Agriculture interprets the Humane Slaughter Act as not applying to birds. The turkeys Americans eat are not like those found in the wild; they have been altered by breeding designed to enlarge the breast. This process has gone so far that the standard American turkey, the descriptively named Broad Breasted White, is incapable of mating because the male’s big breast gets in the way. Here, I tell my students, is an interesting question to drop into a lull in conversation around the Thanksgiving dinner table. Point to the turkey on the table and ask: If turkeys can’t mate, how was that turkey produced?